BRYAN EATON/Staff photo. 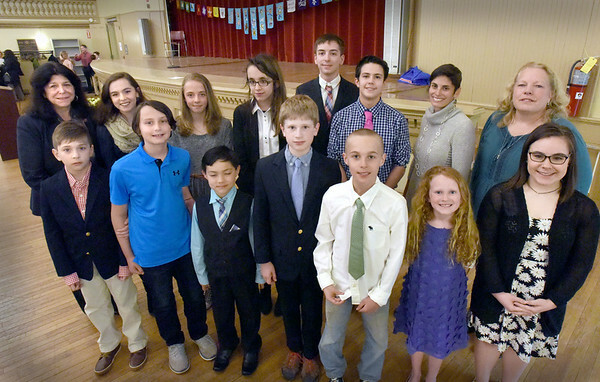 Newburyport's Human Rights Commission held its 22nd Annual Peace Prize Awards Ceremony which celebrate students and adults who promote a sense of welcome and inclusion in the community. Winners pose with Newburyport mayor Donna Holaday, front, from left, Tommy Lynch, Sean Miles, Richie Rocco, Lucas Daignault, Ben Corneau, Maggie Conly and Julianna Camozzi. Back, from left, Holaday, Annaliese Keller, Elizabeth Downs, Asia Caredda, Lukas Phipps, Carlos Jones, Carly Fair and Sue Casey.